We’d love your help. Let us know what’s wrong with this preview of Homes by Abu Bakr al Rabeeah. Abu Bakr, one of eight children, was ten years old when the violence began on the streets around him: car bombings, attacks on his mosque and school, firebombs late at night. Homes tells of the strange juxtapositions of g In 2010, the al Rabeeah family left their home in Iraq in hope of a safer life. They moved to Homs, in Syria — just before the Syrian civil war broke out. To ask other readers questions about Homes, please sign up. Why did the teachers at Abu's school in Canada have their dogs with them? Glenda Light I think the dogs were therapy dogs - used to calm and centre kids with trauma. For every person from Edmonton who lives overseas as an English teacher, this story will bring tears of pride to your eyes. Because Canada knows our responsibility to accept people running from hor This is not a book. This is an achievement. is a charming and warm-hearted book. It is a refugee story like no other. In 2010, the al Rabeeah family left their home in Iraq in hopes of a safer life. They moved to Homs, Syria. Abu Bakr, one of eight children, was ten years old when the civil war broke out on the streets around him. 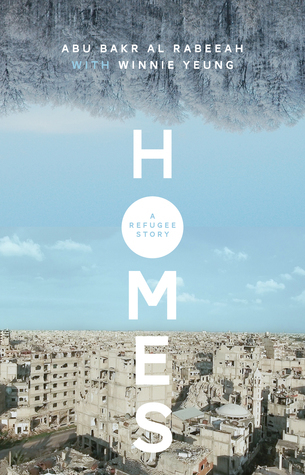 HOMES is his remarkable true story of growing up in a war zone and ultimately finding safety in Canada. With his parent's blessing, Abu Bakr told his life's story to high school English teacher, Winnie Yeung in Edmonton. This heartbreaking, hopeful, and eye-opening book is about one family's journey to find a new home. This captivating read is short listed for Canada Reads 2019. HOMES: A REFUGEE STORY is the first Canadian book that has been chosen for global digital book club 'Big Library Read'. For as long as I can remember, there has always been some sort of conflict ongoing in the Middle East. Despite seeing it on the news regularly, I would say that I was pretty apathetic to it all. That isn’t to say that I didn’t understand the tragic nature of an endless war, but it’s difficult to comprehend the enormity of it all. Abu Bakr’ Homes is the story of Abu Bakr al Rabeeah, as told to Winnie Yeung, about his family’s life in both Iraq and Syria before moving to Canada as refugees in 2015. I still have one more book on the shortlist to read before the Canada Reads debates start on Monday, but as of right now this is my pick for the win. Homes is a gracefully written book that really captures what this year's Canada Reads theme is - a book to move you. It's the story of a young boy's life growing up in the midst of the civil war in Syria as his family hopes to be approved for refugee status in Canada. Entirely told from his perspective, it offers a unique context to the important is I still have one more book on the shortlist to read before the Canada Reads debates start on Monday, but as of right now this is my pick for the win. Homes is a gracefully written book that really captures what this year's Canada Reads theme is - a book to move you. It's the story of a young boy's life growing up in the midst of the civil war in Syria as his family hopes to be approved for refugee status in Canada. Entirely told from his perspective, it offers a unique context to the important issue of war, violence, faith, and the ongoing refugee crisis. It's one thing to see it in soundbites and clips on the news, it's quite another thing to read personal accounts - especially from that of a child, so pure of heart and so far removed from the particulars of war and the adults who start them. Even the fact that this book is the result of that boy, finally living in Canada, dictating his story to his favourite teacher after answering "I want to share my story" to her question of "what is one of your wishes?" is moving enough all its own. One part of Bakr's story that really stood out to me - and moved me - was the game he played with one of his friends, in which they collected as many bullet casings as they could find in the streets on their walks home from school and tried to out-collect the other. This hit me so hard for a few reasons. The first being just the thought that despite the havoc and carnage the grown-ups were causing, the children found a way to still be children, despite the gruesome fact of what their new toy/game was. When Bakr and his little friend realize the reality of the casings, that the reason they were scattered throughout the streets meant that people had been shot at, and it ruins the fun of their game, it hit me that much harder. The innocence of children being slowly but brutally ripped away from them in such a way is truly heartbreaking. But this isn't only moving because of its heartbreaking aspects. Bakr and his family do eventually arrive safely in Canada and begin anew. It only takes up the last part of the book, and while Bakr and his family work tirelessly to adapt, it is heartwarming to read about. Syrian refugees - we rallied and donated clothes and household items to help families locally get settled, we see new Immigrants on the news grateful to be here - yet we miss their personal stories. This simply written book explains the background we need to be truly empathetic. I’m grateful that the author shared his story, he shone a great light on the details of his life, and the universal struggle and hope for safety and security that comes with Homes. A YA classification would bring this bo Syrian refugees - we rallied and donated clothes and household items to help families locally get settled, we see new Immigrants on the news grateful to be here - yet we miss their personal stories. This simply written book explains the background we need to be truly empathetic. I’m grateful that the author shared his story, he shone a great light on the details of his life, and the universal struggle and hope for safety and security that comes with Homes. Homes makes one think about how lucky we are to be Canadian. I cannot imagine sending my children off to school and having to worry about snipers or suicide bombers. This memoir is told by Bakr, reflecting on his life in Iraq and Syria. He shared the dichotomy of the violence and massacres with the hustle and bustle of a loving, close knit family full of siblings, cousins, aunts and uncles. He shares the perspective of a young boy coming to terms with leaving his country, his family, his friends Homes makes one think about how lucky we are to be Canadian. I cannot imagine sending my children off to school and having to worry about snipers or suicide bombers. This memoir is told by Bakr, reflecting on his life in Iraq and Syria. He shared the dichotomy of the violence and massacres with the hustle and bustle of a loving, close knit family full of siblings, cousins, aunts and uncles. He shares the perspective of a young boy coming to terms with leaving his country, his family, his friends and being thrown into a Canadian winter, attending school and having to learn to speak English. This left me with many emotions. Gratitude for being born when and where I was. A deep sadness at the horrors we inflict upon one another. Disbelief that right now there are people out there just hoping for for one more day of safety for their family. Telling this from the view of a young boy made it even more moving for me, a child should never have to live under those circumstances. I can't stop thinking of the quote attributed to Plato. "Be kind, for every one you meet is fighting a hard battle This left me with many emotions. Gratitude for being born when and where I was. A deep sadness at the horrors we inflict upon one another. Disbelief that right now there are people out there just hoping for for one more day of safety for their family. I can't stop thinking of the quote attributed to Plato. "Be kind, for every one you meet is fighting a hard battle." A good reminder to be patient with people who may not understand things right away. No one wants to leave their home and become a refugee. It must be terrifying. I would never have picked this book on my own . . .it is out of every aspect of my experience. I'm grateful the author and his teachers took the time to completely tell this story. Kudos to all who helped get this family to their final destination. And God bless Canada! This is one of the better books I have read on the refugee experience. Homes is the story of a boy, Abu Bakr, and his family living in Homs, Syria and their efforts to leave the violence of the Assad regime. It's beautifully written by his teacher. This is a wonderful book... it's another library ebook that I enjoyed so much that I purchased it. I wish Goodreads offered more than 5 stars because this book deserves it. Note: Homes is the "Big Library Read" for 4/1-4/15/2019 ( https://biglibraryread.com/ ). The Big Library Read makes unlimited copies Homes is the story of a boy, Abu Bakr, and his family living in Homs, Syria and their efforts to leave the violence of the Assad regime. It's beautifully written by his teacher. Note: Homes is the "Big Library Read" for 4/1-4/15/2019 ( https://biglibraryread.com/ ). The Big Library Read makes unlimited copies of the selected ebook available to borrow from participating libraries, so there's no wait. I am Happy to have been born and raised in a country that gave me freedom! Freedom of religion, to dress, sexual orientation etc..... to have an individual mind. Abu Bakr al Rabeeah’s story is captivating, providing a unique window into the ways in which his family struggled to maintain a normal life in Syria, despite the escalating violence and political turmoil during the Syrian civil war. Homes is a short read, the writing perhaps not as polished and immersive as it could be, but I had to keep reminding myself that it was written by a young teenager (with assistance from his English teacher), in a language foreign to him, using Google Translate and a Abu Bakr al Rabeeah’s story is captivating, providing a unique window into the ways in which his family struggled to maintain a normal life in Syria, despite the escalating violence and political turmoil during the Syrian civil war. Homes is a short read, the writing perhaps not as polished and immersive as it could be, but I had to keep reminding myself that it was written by a young teenager (with assistance from his English teacher), in a language foreign to him, using Google Translate and a lot of time and patience. While there are other Canada Reads shortlist titles that are more eloquent (Chariandy’s Brother) or entertaining (Wong’s The Woo-Woo), I think Homes has the more important story and message, one of love and inclusion, that deserves be told, especially in an age of Islamophobia, anti-immigration and protectionism sentiments. Wow. Just wow. Beautifully written and an amazing story. If this book doesn’t inspire and open your eyes idk what would. Honestly I don’t really know what to say about this book. After reading it I’m just at a loss of words. I kept forgetting throughout how young Abu Bakr really was and is and I can’t even begin to grasp all the pain and suffering at such a young age. It’s a truly moving yet terrifying true story that brought me to tears more then once and makes you so so grateful for the privilege and circumstances you have been born into. In this work of creative non-fiction, I was given insight into the story of an innocent. A child of ten being raised up with love and connection, with resilience and faith, and with war. The war in Syria. How this child, and his family, made it out and into Canada. This is Abu Bakr's story. A new Canadian, and so his story has become part of Canada's. 2019 Canada Reads selection- first one I tackled, mostly because of the length. It is well worth reading, and although there is horror, the overarc In this work of creative non-fiction, I was given insight into the story of an innocent. A child of ten being raised up with love and connection, with resilience and faith, and with war. The war in Syria. How this child, and his family, made it out and into Canada. This is Abu Bakr's story. A new Canadian, and so his story has become part of Canada's. For such a little book, this story packs a big punch! As someone who’s always had the safety of a stable country and a life free from daily violence, it’s hard to imagine life in a war zone. “Homes” tells the story of a boy and his family as their world shifts around them, and truly hits close to the heart. The real power in this story is how Bakr’s narration, told through Winnie Yeung, brings together the reality of of his childhood with the realities of war and immigration. I also appreciate t For such a little book, this story packs a big punch! As someone who’s always had the safety of a stable country and a life free from daily violence, it’s hard to imagine life in a war zone. “Homes” tells the story of a boy and his family as their world shifts around them, and truly hits close to the heart. The real power in this story is how Bakr’s narration, told through Winnie Yeung, brings together the reality of of his childhood with the realities of war and immigration. I also appreciate that the story doesn’t end when he leaves Syria, but continues to share his experience on first landing and adjusting. Bakr shares gratitude for being able to move to Canada, but also how that gratitude mixes with grief and guilt when he misses his home and family in Syria. I knew when they had announced the Canada Reads finalist that this is the book I most wanted to read. The story is told from the point of view of a young boy who’s family flea Iraq to Syria for a better life. Shortly after arriving in Syria the civil war started. This book is intense, eye opening and a beautiful story of how a family sticks together through everything. From civil war to becoming a Canadian refugee and the journey in between, every Canadian should read this book. I could not put this book down. I read it in two sittings and find myself deeply moved. I highly recommend it. I think it may be the book that Canada needs to read. Simply told and deeply affecting. Heart wrenching and hopeful at the same time.